Over time, I have come to realize that Toscanini’s earlier performances better display his greatness than the better-known late RCA recordings. Those sessions produced some magisterial performances, to be sure, but the Maestro’s manner, especially in the great symphonies, could turn severe and self-consciously heaven-storming. In these earlier broadcasts, particularly of ‘lighter’ music, his emphasis on and feeling for the singing line emerges more readily, without any sacrifice of rhythmic precision. Thus, the ‘Prélude’ of La jolie fille de Perth is crisp and alert; the liquid woodwind timbres and textures are appealing – only the two oboes sound stiff – and the string theme sings ardently. The violins are shapely in the Serenade. The fourth movement’s flute-and-harp opening is not what you’d expect from the title ‘Gypsy Dance’, but it builds up to a splashy, energetic finish. You rarely hear the Jolie fille music played this well – but, when you come right down to it, you rarely hear it at all. 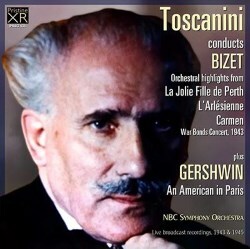 Toscanini plays nonstandard versions of the L’Arlésienne and Carmen suites. To make a five-movement L’Arlésienne, the conductor, rather than tacking the ‘Farandole’ onto the first suite, adds the ‘Pastorale’ in fourth position! Highlights include the gentle, pensive woodwind chorale variation in the firm ‘Prélude’, and the way the conductor uses the ebb and flow of tonal intensity to realize the ‘Adagietto’’s emotional arc. That ‘Pastorale’, rather weighty and sostenuto, seems an anomaly here; the start of the 3/4 section is almost languid. Toscanini begins his Carmen Suite, as one usually hears, with the ‘Aragonaise’ (Act IV Prelude), but then interpolates the ‘Fate’ music from the Act I Prelude. From there, two extended harp arpeggios, each punctuated by a tutti chord, transition into the ‘Intermezzo’ (Act III Prelude). This and the deliberate ‘Dragons d’Alcala’ (Act II Prelude) follow the usual texts, but then Toscanini plays the ‘Toreador’ music from the last act rather than the version from the opera’s opening, preceding it with the introductory passage (sans chorus), and adding some of the contrasting episodes – a nice touch. The 1945 broadcast of An American in Paris proves an unlikely but effective complement to the Bizet works. The maestro had a surprisingly stylish way with the piece – he also recorded it in the studio – and his rhythmic crispness and no-nonsense attack are all to the good, especially at the start. There are some jazzy touches – the trumpet slides lazily into the entries in the strutting passage beginning at 7:15 – though other moments can be stiff. Here, again, wind detail emerges impressively. The overall acoustic, however, sounds a bit ‘canned’, with the dynamic range cautiously limited; it’s a letdown when the biggest climaxes don’t, or can’t, expand further. In a way, the remastering becomes the victim of its own success! The Bizet, especially, makes this a worthwhile acquisition.